The Chinese People's Liberation Army-Navy Jiangkai II-class frigate Linyi (FFG 547) arrives at Joint Base Pearl Harbor-Hickam. Why Are Chinese Frigates in the Black Sea? China’s frigates may be in the Black Sea on a mission that’s part symbolism, part marketing. Marking a new milestone for China’s People’s Liberation Army Navy (PLAN), two guided missile frigates, reportedly the Linyi and the Weifang, entered the Black Sea on Monday. USNI News broke the story, accompanying it with photographs of the Linyi passing through the Bosphorous on May 4. The pair of frigates are en route to Russia’s naval base at Novorossiysk where they will arrive on May 9 and remain until Chinese President Xi Jinping arrives in Moscow to commemorate the 70th anniversary of the end of the Second World War in Europe. The visit of the two frigates could have commercial intentions as well. 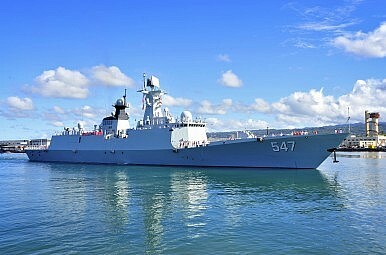 A report in the Taiwan-based Want China Times last week made the case that the PLAN was using the Mediterranean exercise as an opportunity to show off the ability of its Type 054A Jiangkai II-class frigates for the Russian Navy. Since the collapse of the Soviet Union, Russia’s surface ship-building capability is known to have taken a great hit. For China, securing a sale of its naval hardware would be a coup, possibly signaling an inversion of the traditional vendor-client relationship between the Kremlin and Zhongnanhai that has mostly run in one direction in the past. China’s own naval and broader military modernization has meant that it has developed its domestic defense industry. As Gabe Collins and Andrew Erickson noted in The Diplomat, back in 2012, China’s military shipyards are building frequently, building well, and building fast. If Russia is looking to expand its surface fleet, it might make sense for it to buy from China instead of building at home. Doing so would free up some capacity for use in other Russian projects, including its still-strong submarine building program and its other plans to bolster its military capabilities in the Arctic. When it comes to building surface ships, Russia may have to acknowledge that China has the comparative advantage. INF Withdrawal: Bolton’s Tool to Shatter China-Russia Military Ties?Working with Vietnam, Russia's Rosneft Draws China’s IreChina's Bid to Dominate the Global Submarine Export MarketSino-Russian Shadow Competition Plays Out in EgyptDid Russia Just Ask China to ‘Buzz Off’ on the South China Sea?